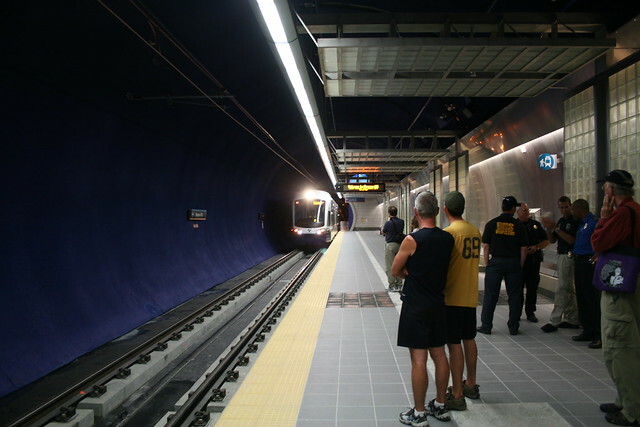 When the Downtown Seattle Transit Tunnel finally got cellular phone service last March, the tentative expectation was that the Beacon Hill Tunnel would follow later this year. University Link has long had it, so Beacon Hill is the last segment that drops calls and freezes page loads. ST spokesperson Kimberly Reason told me earlier this week that cell service there is now scheduled for mid-2018 “to allow for design modifications for the power infrastructure.” So for a few months longer, you’ll be forced to read dead trees or talk to your neighbor for at least a few minutes on every trip. PS: by listener request, the podcast is now available on Google Play as well as iTunes. Sound Transit’s ridership continues to rise, fueled mostly by light rail expansion, according third quarter ridership numbers released by the agency last week. Ridership across the system was up 6.5% over the same quarter in 2016. In an accompanying press release, Sound Transit lauded current year-to-date ridership in 2017, up 26% on Link and 12% across the entire system compared to the same time period last year. Light rail ridership continues to climb, showing strong growth of 13.5% during the third quarter compared to the same time period last year. Overall this year Link ridership is up 26%. 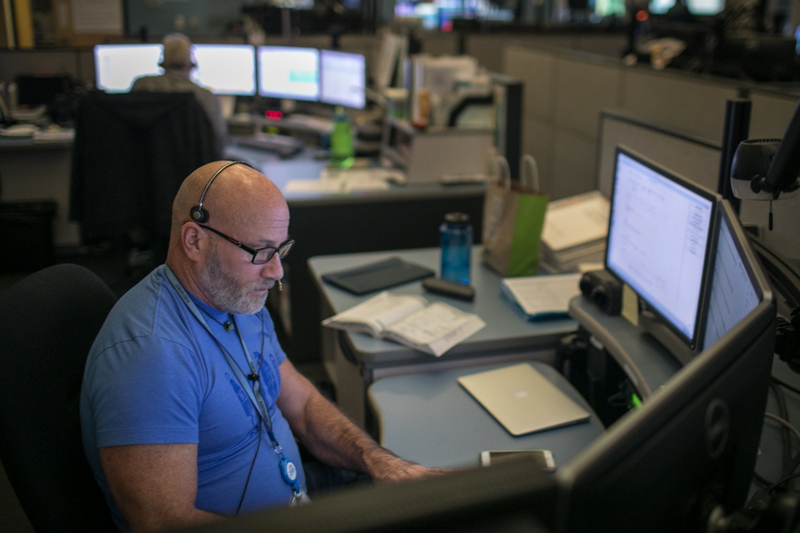 Behind every bus driver and Link light rail operator is a team huddled behind a crowd of computer screens, monitoring buses and trains as they traverse the region. Sound Transit’s Link Control Center (pictured above) and King County Metro Transit’s Control Center (TCC) are collocated inside Metro’s Transit Control Center Building on the south side of the city. But when there is a breakdown or a medical emergency, the TCC is ready to respond 24 hours a day. Last week on a rainy afternoon, coordinators spoke in hushed, unhurried tones as the evening commute commenced. Frank and I are taping soon, so please leave your questions for us in the comments. As always, try to keep it to a single question, and we’ll do the best we can (given no prior preparation) to answer it. We may tape as early as tonight, so don’t dawdle. 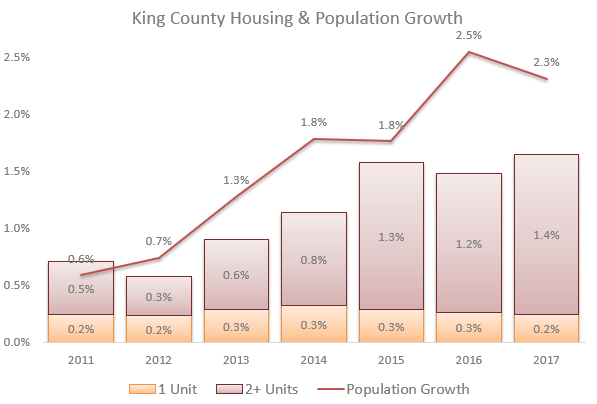 King County’s population growth has consistently outpaced housing creation. Housing is percentage of prior year total units. Last year, the population of King County grew 48,600, or 2.3%. The housing stock grew 14,700, or 1.6%. The gap, 0.7%, is a rough measure of our failure to create enough housing. This is the sixth straight year when population growth exceeded housing creation in King County. Snohomish and Pierce appeared more balanced until 2014, but now face heightened housing pressures as displacement of King County workers from expensive local housing markets grows. The gap between population and housing growth is an increase in household size. Over this decade, 11.5% more King County residents have squeezed into 8.3% more housing units. That might not seem so large, but it’s about 27,000 missing homes. Those on the margins of the housing market live with parents longer or take on more roommates. Some are homeless. The housing shortage also manifests in rationing via higher rents and rising home prices. The King County Council recently approved a $2.75 all-the-time flat fare, which will take effect in July of 2018. This will eliminate most of the passenger-requested resets on ORCA readers that require operators to push some buttons on the reader, and eliminate one more source of fare arguments. 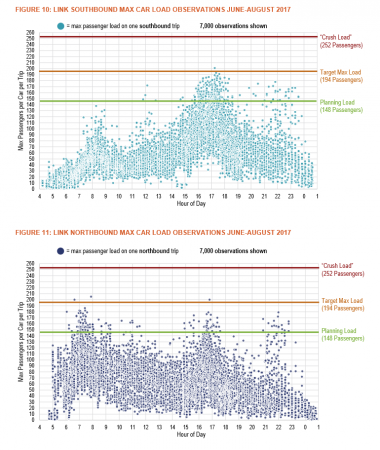 Community Transit has followed suit on the ORCA reader resets by proposing that each of its commuter routes have a single fare for each payer category. 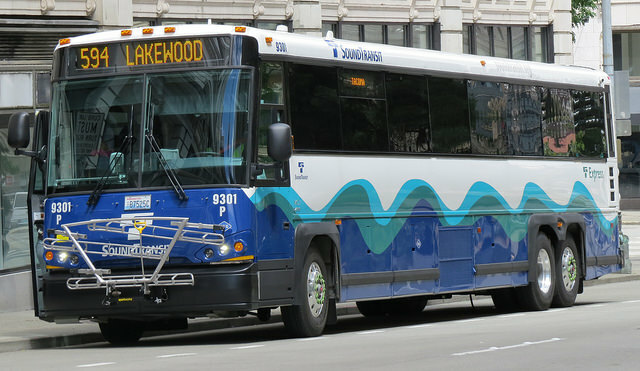 Sound Transit hasn’t yet put forward a similar proposal to get rid of ORCA reader resets on inter-county ST Express bus routes, but has been looking at the issue. Any ST Express fare restructure would likely be implemented in latter 2018. If the Sound Transit Board opts to transition to route-based fares to replace the county-line-crossing surcharge, thirteen routes would alter their fares. Fifteen ST Express routes do not cross a county line, and would therefore be unaffected by such a fare restructure: 522, 540, 541, 542, 545, 550, 554, 555, 556, 560, 566, 567, 577, 580, and 596. Last week’s Seattle Times profiles some Phinney activists ($) who are fighting some relatively affordable apartments because the project doesn’t include parking. 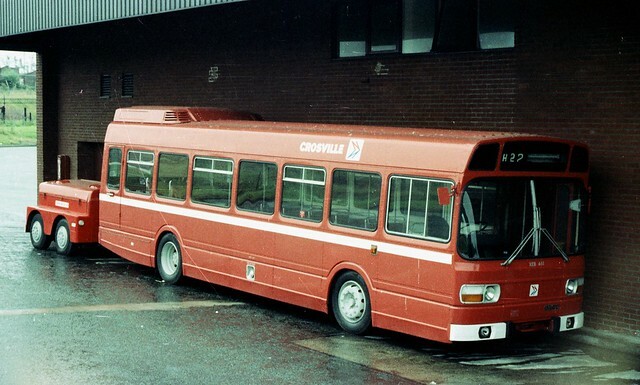 A McGinn-era policy relaxed parking requirements in frequent transit corridors. The current standard is 15-minute intervals, which nearby Route 5 doesn’t meet due to unreliable trips, and a few schedule adjustments to time transfers that bring headways a bit above 15. The city is planning to update the rule to include corridors like Route 5. There’s no good reason to have parking requirements anywhere, regardless of transit service levels, so any relaxation is a step in the right direction. Thanks to bad land use and transit underinvestment, there are absolutely lifestyle choices that can make it hard to follow your daily routine without a car — especially for parents. Nevertheless, the hypocrisy here is astounding. These neighbors have structured their lives to “need” a car. That is absolutely their right. But they’ve neglected to a secure a home where they can store that car without using public property on their street. Or perhaps they have a garage, which is filled with stuff, in which case this is simply a matter of inconvenience. Again, that’s all fine and good, and I don’t begrudge them that. But then, these same people expect newcomers to, in effect, buy or rent a space regardless of whether they have any interest in owning a car. This is a tax on newcomers to further subsidize the existing freebie from SDOT. These newcomers are often people with far fewer financial resources than residents who, in many cases, have benefited from enormous windfalls in property values over the past few years. It is a thoroughly regressive policy, especially during a housing shortage, and bravo to Rob Johnson and the rest of the Seattle government for scaling it back wherever they can. The Sound Transit Service Implementation Plan (SIP) is a goldmine of great data. Lizz has already reported on some of the big-picture stuff, but check out this graphic depicting load factors on Link. As one who experiences Link’s load factors daily, I’m fascinated by the patterns that I can recognize. We see the two rush hour peaks, and that the most crowding occurs to and from the Rainier Valley. There are also inconsistent peaks around lunchtime and 10pm, which I assume are related to day and night games. It’s also interesting that the practical limit appears to actually be about 200 people per car. Frequent riders will recognize the case where it is actually impossible to add riders. Given the seating layout, I don’t see how a “crush load” of 252 is feasible. Planning for the conversion of King County Metro route 120 into RapidRide H has begun a second round of community input. Most of the alignment will be exactly how route 120 runs today. However, the alignments north of downtown, through White Center, and near Burien Transit Center, are being reconsidered, as is stop spacing. The first survey on the H Line was conducted by SDOT back in March, covering just the stretch from the West Seattle Bridge to Roxbury Ln SW, and focusing on road improvements. Zach summarized the lane options. The latest survey covers frequency, reliability, span of service, fare, number of rides to complete typical trips, pedestrian accessibility, stop spacing, lighting, traffic signals (mostly for pedestrians), bike lanes, and, since it is being conducted by Metro, is for the whole corridor. Community meetings are planned for the second week of December in Burien and White Center, time and date to be determined. The survey responses so far for this round are available for public viewing. No deadline has been set for participation in this latest survey that opened November 14. 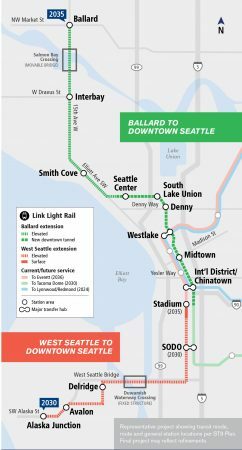 Funding for the H Line is coming from Metro, the Move Seattle levy, and various grants, not all of which have been funded yet. 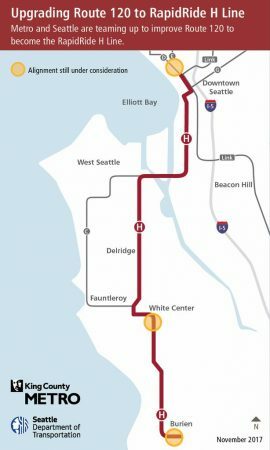 The H Line is planned to open in 2020, and will be the second of 20 additional RapidRide routes planned to be open by 2040, with 13 of them planned to be open by 2025. Last Thursday, Sound Transit and the City of Redmond held an open house to share the latest designs for the two stations on the Redmond Link extension, planned to open for service in 2024. 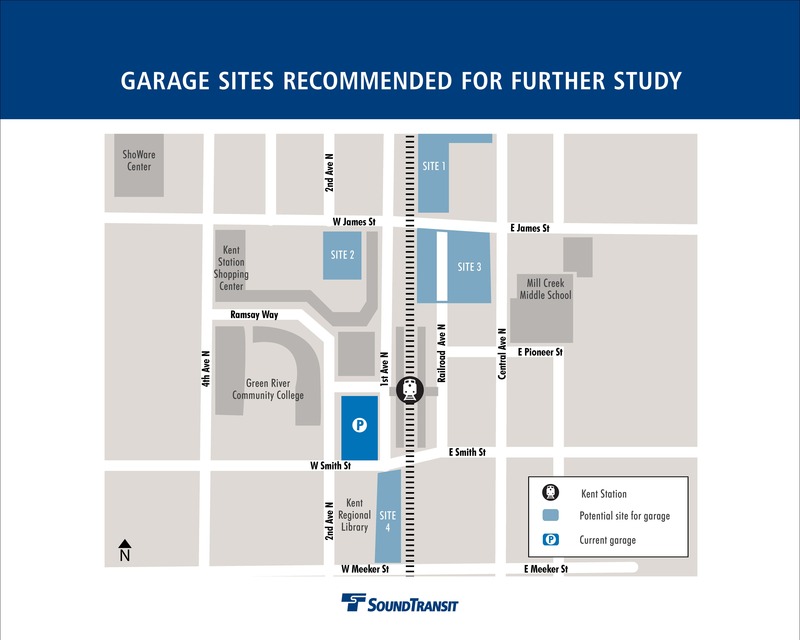 Following a Sound Transit Board decision in June to ratify alignment recommendations from the City of Redmond, the agency has moved quickly advancing design on stations in Downtown Redmond and Southeast Redmond. The Downtown Redmond station is a simple elevated design between Cleveland St and NE 76th St. Elevating the station eliminated conflicts with pedestrians and vehicles crossing the line. The Redmond Central Connector trail is diverted very slightly to the north. 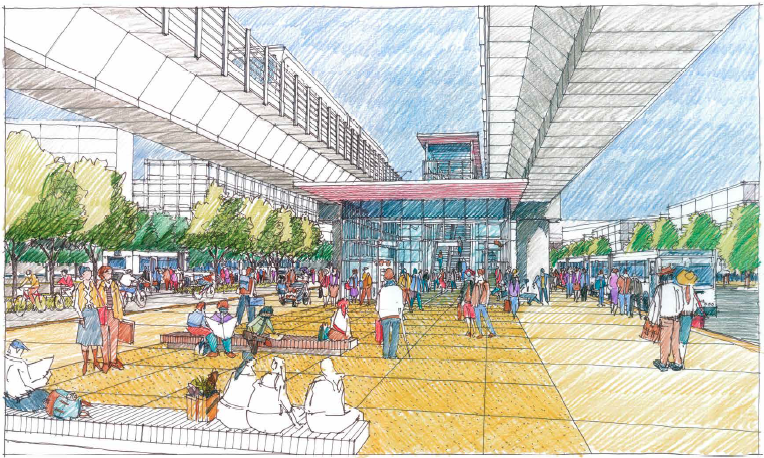 There will be space for bus access and layover on both sides of the station area. The station platform is centered above 166th Ave NE, with entrances at either end. 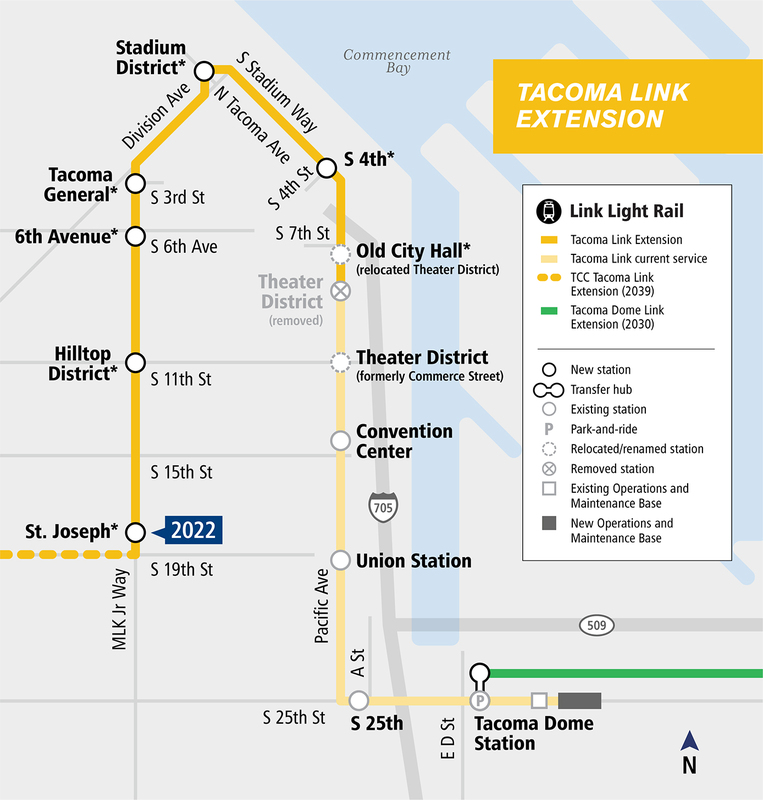 The extension of Tacoma Link to the Hilltop neighborhood is nearing the start of construction, slated for next year, and Sound Transit has recently finalized several key details, including an order for new light rail vehicles, the permanent names for the stations, and the final design of the stations after public feedback. 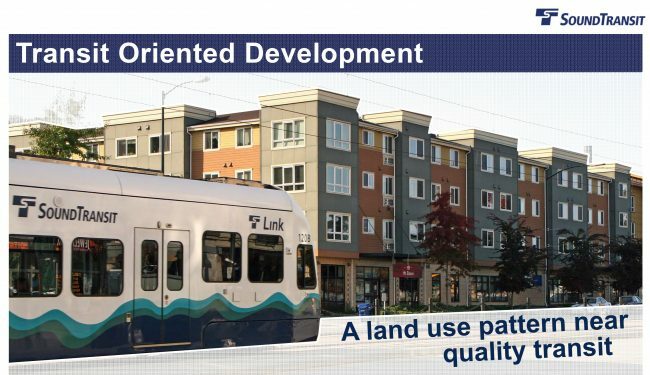 On Thursday, the Sound Transit Board approved a zero-cost land transfer to two affordable housing developers for a parcel of land in the First Hill neighborhood valued at $8.6M. In a joint project, Bellwether Housing and Plymouth Housing Group propose building a high-rise apartment with 308 subsidized units on a half-acre parcel near the corner of Madison Street and Boylston Avenue. The board also approved moving forward with two other affordable housing projects near the future Roosevelt Station and Capitol Hill Station. A new state statute requires Sound Transit to prioritize affordable housing by offering at least 80% of a surplus property first to affordable housing projects for families making 80% or less of area median income (AMI). To accomplish this goal, the legislature allows Sound Transit to discount the price of parcels or offer a no-cost land transfer to qualified entities. All three affordable housing projects request a discount in land value to reduce the cost of the projects. The New Bus Campaigners from STREETFILMS on Vimeo. Last summer, King County Metro and Sound Transit agreed to lower youth fares for ORCA users from $1.50 to 50 cents (Metro) and $1 (Sound Transit) for the season. Many students get free passes for the school year, but pay the full fare during the summer (here defined as June 17 – September 4). Ridership isn’t always terribly responsive to fare changes, but this is not one of those cases. Youth ORCA card use shot up 34%, 39%, and 42% for Metro, ST Express, and Link respectively over Summer 2016 counts. It is unclear if this is new riders or the conversion of cash-paying riders to ORCA, but it’s a data point that suggests incentives to not use cash drive ORCA conversion. This comes out to over 1,500 additional boardings per day. Metro also handed out 11,000 youth ORCA cards during the promotion. Youth cards remain available via mail, or in person at a handful of locations. 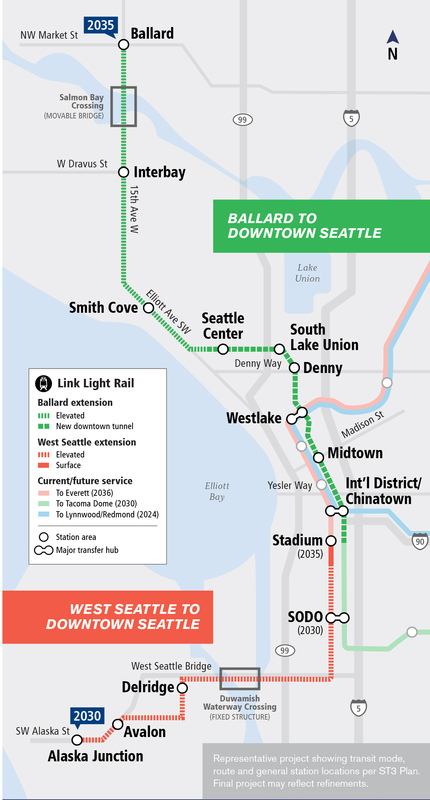 The 4.7 mile Link extension isn’t scheduled to reach West Seattle for at least another 13 years, but residents aren’t wasting any time preparing for light rail expansion. 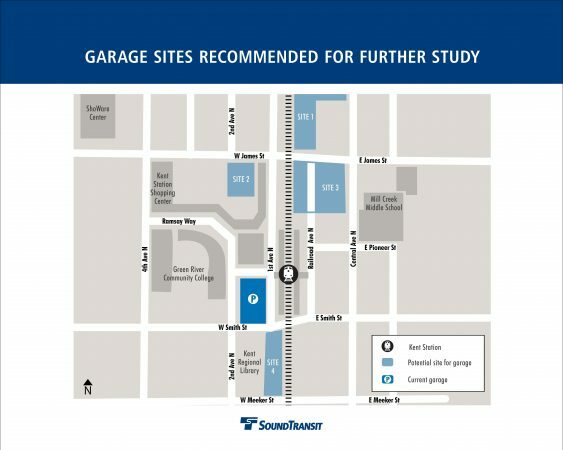 Not wanting to wait for Sound Transit to launch the formal public process scheduled to begin in early 2018, on Wednesday the Junction Neighborhood Organization hosted the transit agency to discuss the project which includes three new stations (plus the expansion of two existing stations) and a rail-only fixed span bridge crossing the Duwamish River. To speed up the project timeline Sound Transit wants the preferred alternative identified by early 2019, before the environmental review process is completed. Construction is anticipated to start in 2027. Focusing on the current stage, the planning process, Cathal Ridge, project director for the West Seattle and Ballard Link Extension, told the large crowd gathered at the Senior Center of West Seattle that Sound Transit plans on setting up three groups to facilitate engagement for both the West Seattle and Ballard extension projects: an elected leadership group, a stakeholder group and an interagency group. The elected leadership group will be comprised of elected officials, mostly coming from the ST board, and will meet at key project milestones. That group will appoint about 20 transit riders, residents, business owners, etc. to a stakeholder group, which will meet every two months. 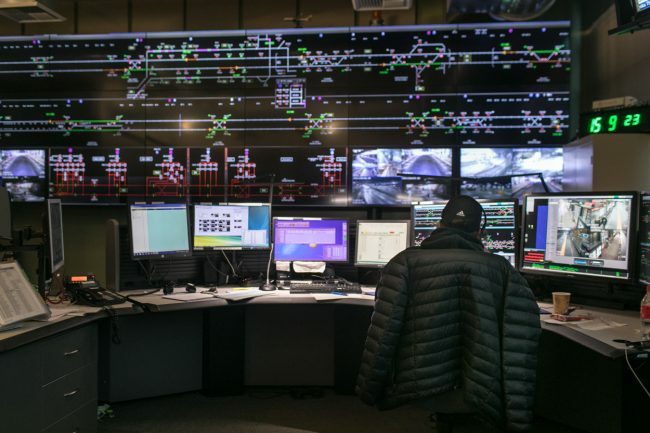 The stakeholder group will make recommendations to the elected leadership group, which will then, in turn, make recommendations to the full Sound Transit board. Sound Transit is finally moving forward with improvements to two Sounder stations promised in the 2008 ST2 ballot measure. Postponed by the recession, the projects will add a new parking garage to both the Auburn and Kent Station, each containing roughly 500 stalls and not yet-defined non-motorized improvements. ST predicts ridership on Sounder will double by 2040. In Kent, four locations were evaluated for the future parking garage. Both ST staff and Kent’s City Council recommended a site located south of James Street along Railroad Avenue, less than a block from the station. Karen Kitsis, a director at ST, said the large size of the lot allows for the consideration of multiple design options for the new parking structure. Kitsis also told the committee that this spot would provide better bus-rail connections. 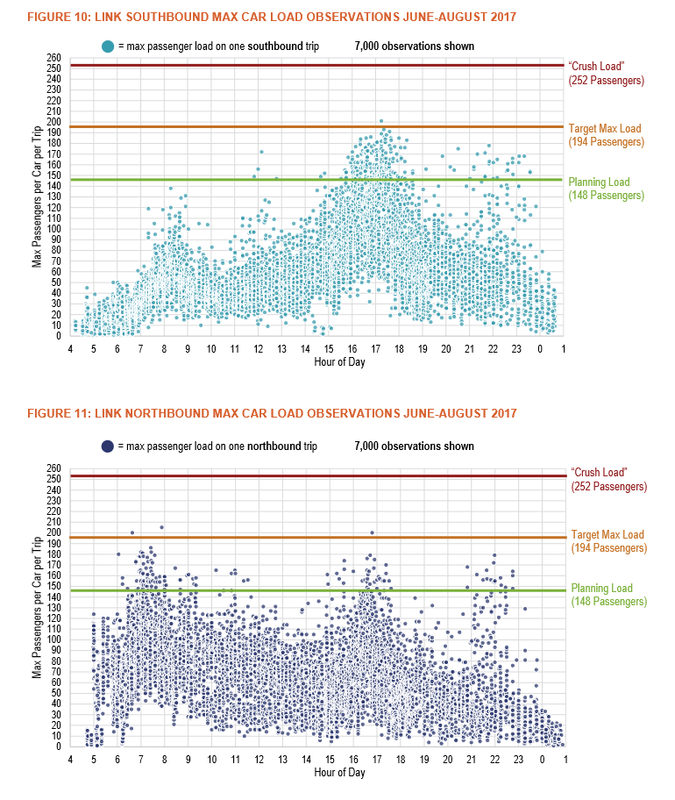 King County Metro Transit, who is coordinating with Sound Transit on the project, was in favor of the recommended spot due to better transfers. The chosen site also had the lowest forecasted cost estimated at $65m. Two of the other sites considered were already in use while another required a pedestrian bridge. Costs went as a high as $82m for other sites not recommended.